Lakshmy Nair has been a professional writer since 2004 and has worked for companies such as Lionbridge Technologies, Mumbai, India and Rand Worldwide, Mississauga, Canada. She holds an engineering degree from the University of Mumbai, India and a certification in technical communications from George Brown College, Toronto, Canada. Regular exercise helps in the prevention and management of health conditions such as diabetes, high blood pressure, heart disease and obesity. However, it can also improve your mood, lift your spirits and make you feel better about yourself. When you exercise, your body releases chemicals that boost your sense of well-being and suppresses hormones that cause stress and anxiety. Physical activity is an effective tool against depression and you can find many different ways to make it a pleasurable pastime. Does physical activity improve your mood? A recent study30227-X/fulltext) observed the link between physical activity and mood for 1.2 million Americans, finding that exercise absolutely has an impact on depression. Researchers found that those who exercised reported having 1.5 fewer poor mental health days in the last month than those who did not exercise. Interestingly, people who exercised 30 to 60 minutes saw the best results, with an average of 2.1 fewer poor mental health days, while people who exercised more than three hours a day had worse mental health than people who didn't exercise at all. Of the 75 activities recorded, the researchers found that team sports, cycling, and aerobic and gym activities made the biggest differences. The body produces endorphins, which are chemicals that reduce the perception of pain, improve immunity and help you relax. Endorphins are natural mood boosters that enhance feelings of optimism and satisfaction. Exercise promotes the generation and release of endorphins, while reducing the activity of hormones such as adrenalin and cortisol, which promote feelings of anxiety and tension. Regular exercise can help you attain a happier state of mind and a better quality of life. Stress can cause a vicious cycle of negative thinking, worrisome thoughts and physical symptoms such as muscular discomfort, indigestion and pain. Exercise provides a distraction from your worries, whether you exercise by yourself at home or in the company of friends. It also gives you an opportunity to socialize. You can walk in a group, go to the gym or attend classes with friends. As you widen your social circle and strengthen your bonds with people, you will feel happier. You will lose weight, get fitter and healthier. You can greatly reduce your risk of chronic illnesses, which are major contributors to stress and anxiety. You will also feel a sense of accomplishment as you work out harder and for longer intervals of time. You do not have to indulge in demanding physical activity to reap the psychological benefits of exercise. The Harvard Medical School says that walking, stretching, mental exercises, breathing techniques and muscle relaxation techniques can all be effective in combating stress. To alleviate stress, practice slow, relaxed breathing anywhere and at any time. Controlled muscle relaxation is another effective combatant against tension and anxiety. Meditation is a rewarding exercise that relaxes your mind, makes you more positive and reduces physical signs of stress such as an elevated heartbeat and hypertension. You can also perform chores such as gardening and housecleaning, which can provide substantial exercise and lift your spirits. Exercise can be a useful substitute for antidepressant drugs, according to a 1999 study, originally published in the "Archives of Internal Medicine." In the study, men and women who used aerobic exercise to combat depression had the same success rates as participants who used antidepressants or a combination of exercise and antidepressants. 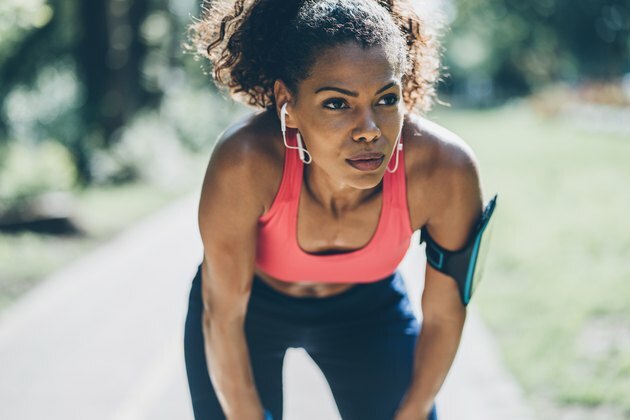 After six months, most of the original participants contributed to a follow-up study, which found that those who stuck to a regular exercise regimen had a lower risk of relapse into depression. According to the Association for Applied Sport Psychology, long-term exercise programs of 10 weeks or longer durations offer the best defense against depression symptoms. Does working out improve your mood? Can you tell the difference in your mood when you skip a workout? Let us know in the comments! Why Is Exercise Important to Teenagers? How Many Calories Do I Burn Riding an Exercise Bike? Does Running After Quitting Smoking Improve Lung Recovery? How Often Should I Exercise Per Week?